I’ve been asking Nancy McGee of Absolutely Southern France Tours to tell me all about her Mediterranean cruise shore excursions. There are several of you who have contacted the Barefoot Blogger for information. Read on and learn about going ashore along the French Riviera. Even if you’re an armchair traveler, you’ll enjoy the visit. As I’ve learned, when you travel with an expert like Nancy, you’re going to explore and experience the best spots for food, scenery and lifestyle along the Côte d’Azur. Let’s see what she has up her sleeves for us to do. I love every inch of the French Riviera – from the narrow medieval streets of St Paul de Vence to glitzy Nice and Cannes to the adrenaline surge of the Monaco Grand Prix. When people ask me what they absolutely must see during their shore excursion, the answer is ‘everything’. Of course this is not always practical and so my Riviera tours offers what I consider the major highlights. The Riviera is addictive – once hooked visitors invariably return to see what they missed the first time. France conjures up images of gourmet restaurants, boulangeries and local markets offering a breathtaking array of fresh, local produce, cheeses and regional specialties – and that’s exactly right. Since the weather’s good why not make the first stop at the market and shop for a picnic? (Always a hit if with children.) And let’s not forget a bottle of rosé wine from Provence -‘de rigeur’ for a French picnic. With appetites appeased – for now at least – the olfactory senses are in for a treat and they’ll get just that in Grasse, the Riviera’s flower capital.A tour of a perfume factory is an absolute must – and an excellent place to buy gifts. This is a really charming historic town with an 11th century cathedral, perfume museum, sandy beaches and fine dining. Visit Gourdon and those dreams will come true with a sampling at the famous chocolate factory. But leave room for artisan ice cream in floral flavors, violet, rose, jasmine….sublime. And there’s no need to worry too much about the waistline because this beautiful old fortress town is built on a high promontory with stunning views – a good way to work off the day’s excesses. The tiny medieval village of Tourrettes-sur-Loup perches on a rocky spur and is an all-time favourite visitors. It boasts impressive historic buildings including a 15th century church, arts and crafts boutiques, an annual violet festival and museum. 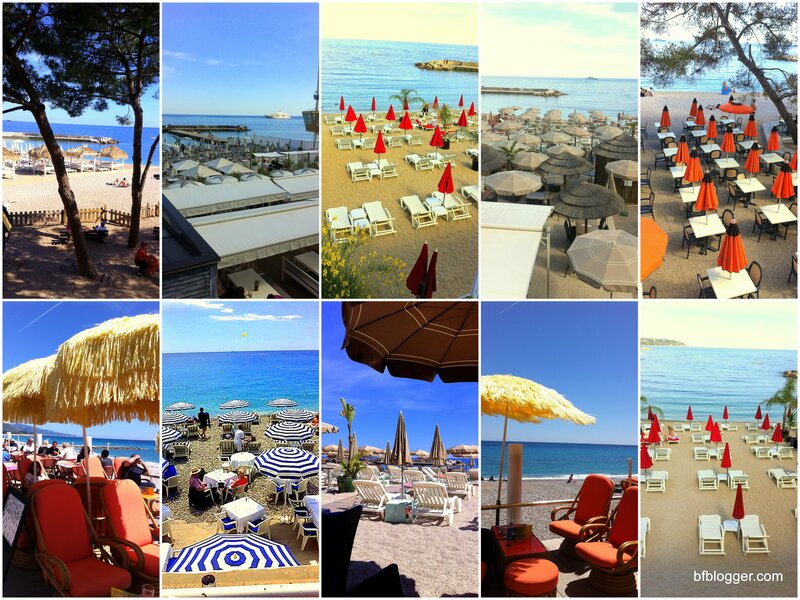 Just a stone’s throw from Nice and Cannes it is definitely worth a detour. St Paul de Vence is one of the oldest medieval towns on the Riviera and also known as the artist’s village – it was home to Chagall to name but one. It’s a joy to simply stroll the colourful streets full of art galleries and boutiques. Olive oil and wine tastings, and a visit to an olive oil mill can be arranged, as well as lunch at a restaurant overlooking the Mediterranean. The tiny principality of Monaco fits comfortably into a day trip with time to view the exquisite Palace of the Prince and the cathedral where Prince Rainier and Grace Kelly were married, followed by the Changing of the Guards. Visitors always fall in love with this typical medieval cliff top village of narrow lanes, stone buildings and breathtaking views of the Mediterranean. Éze is in the heart of perfume country and a tour of the perfume factory can be arranged as well as a visit to its impressive botanical garden. The city of Nice needs no introduction! Aside from a reputation for glamour, it is steeped in history, with evidence of a settlement as far back as 350bc, and its historical centre dates back to the 13th century. Highlights of the tour include a walk along the “Promenade des Anglais” – former haunt of the British aristocracy, an unsurpassed, flower market and Michelin star restaurants. Shore excursions by Absolutely Southern France are fully private 7 or 8 hour customized experiences with English speaking local and professional driver/guides with a van or sedan. Nice City Break: Marc Chagall Makes It Nicer. Nice was the home of artist Marc Chagall during the last part of his life and the largest collection of his work is permanently enshrined in the Musée National Marc Chagall, specifically, his “Bible” series. The museum is a bit hard to find, nestled in a park-like setting in a residential neighborhood of Nice, but it is every bit worth the effort to go there if you’re an art lover. In addition to the paintings which Chagall offered to the French State in 1966, he created the stained glass windows facing the garden and in the concert hall. Chagall’ surrealistic approach to his subject and bright basic colors is what delighted me with the exhibit. His deep understanding of the Bible, which came from his roots and from years of study as a Hasidic Jew growing up in Russia, is more than obvious in his work. Yet the simplicity of his characters makes the stories easy to grasp for all. Next time you plan your Nice city break, work in a morning or afternoon at the Musêe National Marc Chagall. Spend some time in the garden and stop for a coffee and dessert. It’s a favor to yourself you won’t forget. Traveling by Train to Nice. Nice! Now that I’ve learned how easy traveling by train to Nice is, I planning to travel a lot by train in Europe, I’m glad to have the “senior” rail pass. The senior discount on the fare from Avignon to Nice makes the trip incredibly affordable– roundtrip, first class. Getting to the train station from Uzes, I have two choices. Drive “Lucy” to Avignon and park her with her 4-wheeled friends at the train station; or catch the bus from Uzes to the train station in Avignon. I prefer the first option. Even with paying for parking at the train station, the total cost of transportation is less than driving back and forth to Nice. Plus, I don’t have to worry about parking places in Nice after I arrive. The TGV train from Avignon to Nice in the first-class coach is a treat. If you’re lucky, you’ll get a seat with no one beside or across from you. You can stretch out as much as you please. As you skirt along the Mediterranean from Marseilles to Nice, you get a glimpse of the beaches and the coastline villas. There’s a blue-sky sunny day with only a few clouds. From one side of the train you see sunbathers stretched out on mats and lounge chairs on the beaches. The temperature is in the high 60s. The view from the left windows reveals town people walking busily down the streets wearing leather jackets. Stretches of low forests with cedars, olive trees and pines are interrupted by occasional towns. Beaches appear from nowhere as the train speeds along. The sea draws closer to the tracks. It darts away again. 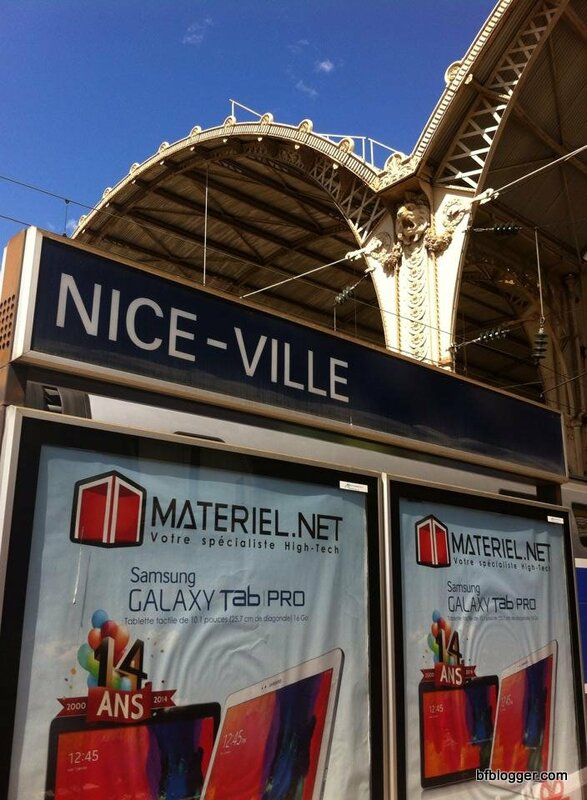 Train stations with familiar names click by alerting passengers that Nice is ahead. High-rise condos and apartment buildings are beginning to crowd together on the hills to the left of the train tracks. More are packed together towards the sea. Old and new, unkept and clean; the contrast of tan, yellow, reddish-brown and, occasionally, green stucco and concrete structures seem to blend together in perfect harmony. There’s no better way for a “foodie” to recap a year’s travel than to revisit meals and favorite foods devoured along the way. Fresh Fruit, Brie and Lavender Honey on Crusty French Bread for Lunch! A friend from North Carolina was accompanying her daughter to Nice to enjoy some “together time” before the daughter, Jacqueline, signed into classes in London. Jacqueline is completing her freshman year abroad from Florida State University after spending the first part of the year in Florence. Now that I’m planning to travel a lot by train in Europe, I’m glad to have found out about the “senior” rail pass. The discount on the fare from Avignon to Nice was incredible — 75 Euros roundtrip, first class. 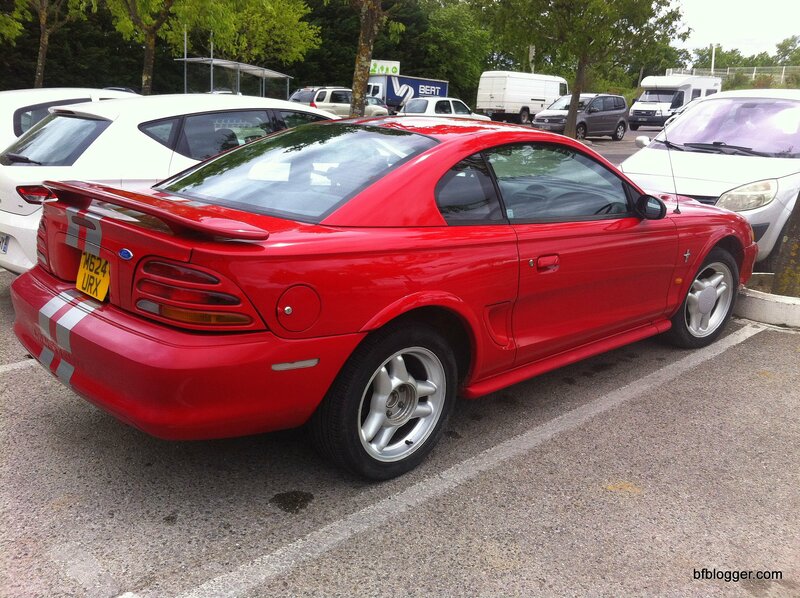 With “Mustang Sally” now at my disposal, I drove to Avignon and parked her with her 4-wheeled friends at the train station. Even with paying for parking, the transportation cost was less than if I taken Sally and paid for gas. 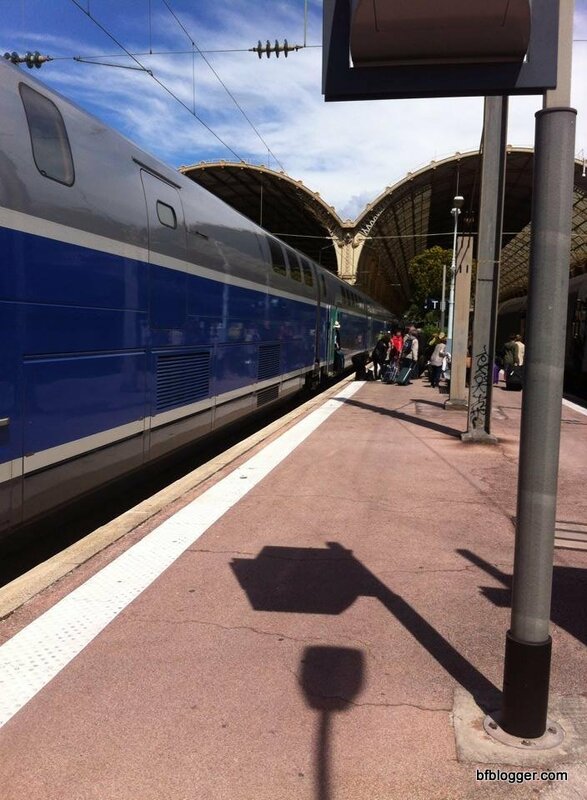 This blog posting was started on the way from Avignon to Nice on the TGV train. Join me as I experience the comfortable ride in the first-class coach. Fortunately, there’s no one beside or across from me. The table for four and the seats are empty so that I can stretch out as much as I please. We are skirting along the Mediterranean from Marseilles to Nice, getting glimpses of the beaches and coastline villas. It’s a blue-sky sunny day with only a few clouds. Today the Beach… tomorrow the town!